Objective To investigate the effectiveness of facilitated physical activity as an adjunctive treatment for adults with depression presenting in primary care. Design Pragmatic, multicentre, two arm parallel randomised controlled trial. Setting General practices in Bristol and Exeter. Participants 361 adults aged 18-69 who had recently consulted their general practitioner with symptoms of depression. All those randomised had a diagnosis of an episode of depression as assessed by the clinical interview schedule-revised and a Beck depression inventory score of 14 or more. Interventions In addition to usual care, intervention participants were offered up to three face to face sessions and 10 telephone calls with a trained physical activity facilitator over eight months. The intervention was based on theory and aimed to provide individually tailored support and encouragement to engage in physical activity. Main outcome measures The primary outcome was self reported symptoms of depression, assessed with the Beck depression inventory at four months post-randomisation. Secondary outcomes included use of antidepressants and physical activity at the four, eight, and 12 month follow-up points, and symptoms of depression at eight and 12 month follow-up. Results There was no evidence that participants offered the physical activity intervention reported improvement in mood by the four month follow-up point compared with those in the usual care group; adjusted between group difference in mean Beck depression inventory score −0.54 (95% confidence interval −3.06 to 1.99; P=0.68). Similarly, there was no evidence that the intervention group reported a change in mood by the eight and 12 month follow-up points. Nor was there evidence that the intervention reduced antidepressant use compared with usual care (adjusted odds ratio 0.63, 95% confidence interval 0.19 to 2.06; P=0.44) over the duration of the trial. However, participants allocated to the intervention group reported more physical activity during the follow-up period than those allocated to the usual care group (adjusted odds ratio 2.27, 95% confidence interval 1.32 to 3.89; P=0.003). Conclusions The addition of a facilitated physical activity intervention to usual care did not improve depression outcome or reduce use of antidepressants compared with usual care alone. Trial registration Current Controlled Trials ISRCTN16900744. A Cochrane review3 of physical activity interventions and depression suggested a pooled standardised mean difference of 0.82 (95% confidence interval 0.51 to 1.12), based on 23 trials and 907 participants. This evidence on the effectiveness of physical activity should be considered with caution, however, owing to several methodological issues. Many of the included trials were small, with even the largest reporting fewer than 50 participants per treatment arm. The majority of trials recruited participants from non-clinical settings, often offering financial or other incentives to those who agreed to participate. Most studies involved relatively short follow-up periods so that evidence for a more sustained benefit is limited, and, finally, few of the interventions designed to increase physical activity were readily applicable to clinical practice. It is therefore difficult to be confident about generalising the pooled results of the meta-analysis3 to the population with depression treated by doctors in primary care. We report the findings of the TREAD (TREAtment of Depression with physical activity) study,5 which investigated the effectiveness of a facilitated physical activity intervention in addition to usual care for the treatment of depression in adults presenting in primary care. Our inclusion criteria were broad as we wanted to recruit adults presenting in primary care with new episodes of depression. However, we excluded those who had failed to respond previously to antidepressants as this group often requires more intensive interventions. We also excluded those aged 70 or more as we thought this older group might have greater physical health problems, making the intervention more difficult to implement. Most of the participants were identified by their general practitioner during routine consultations, although in some practices the electronic patient records were also regularly screened for details of adults with a recent diagnosis of depression to identify any potentially eligible people. The study targeted adults aged 18-69 who either were not taking antidepressants at the time of assessment or had been prescribed antidepressants within four weeks of assessment but had not taken these for at least four weeks before that period. General practitioners excluded those who were unable to complete self administered questionnaires in English; had medical contraindications to physical activity; were being treated for psychosis, bipolar disorder, or major substance misuse; or were pregnant or breast feeding at the time of assessment. At baseline, patients were only eligible to be included in the study if they had a current diagnosis of ICD-10 (international classification of diseases, 10th revision) depressive episode F32 from the computerised clinical interview schedule-revised,7 8 a Beck depression inventory9 score of at least 14, and provided written informed consent. Recruitment for the trial took place between August 2007 and October 2009 in general practices in the south west of England. Randomisation was stratified to take account of self reported antidepressant use (yes, no) and was minimised by severity of depression (clinical interview schedule-revised score ≤25, 26-33, ≥34 at baseline), recruiting centre (Bristol, Exeter), and self reported level of physical activity (≤1, 2-3, ≥4 days per week, with at least 30 minutes of moderate or vigorous intensity physical activity). Treatment allocation, concealed from the study researchers using an automated telephone system, was administered remotely and employed a computer generated code. Owing to the nature of the intervention, none of the participants, general practices, clinicians, or researchers performing the outcome assessments could be blinded to treatment allocation. Collection of follow-up data took place between August 2008 and October 2010. Participants were asked to provide data at three time points; four, eight, and 12 months post-randomisation, using a self completion questionnaire to eliminate any observer bias. The four month follow-up was chosen as the primary outcome endpoint as it represented the stage in the intervention period at which we expected to observe the largest effect, as well as being an appropriate point at which to review the participants’ progress from a clinical perspective. The eight month follow-up broadly coincided with the end of the intervention delivery period,. Data were collected at 12 months to investigate any longer term effects of the intervention on study outcomes. To maximise retention, researchers arranged to meet participants to supervise their data collection at the four and 12 month follow-up points, whenever possible. Participants who were unable to attend these follow-up sessions were contacted by telephone to arrange a further appointment or were sent the questionnaire by post if a face to face session was not possible. Due to restricted resources, eight month follow-up was done solely by postal questionnaire. Participants in both groups were asked to continue to follow the healthcare advice of their general practitioner for their depression and were therefore free during the trial to access any treatment usually available in primary care, including the use of antidepressants, counselling, referral to “exercise on prescription” schemes, or secondary care mental health services. In addition to this usual care, participants allocated to the intervention group were also offered assistance from a physical activity facilitator. The intervention was based on theory10 11 and was designed to provide individually tailored support and encouragement to engage in physical activity (see box for a summary of the key features). A manual6 was devised to guide the physical activity facilitators, which described a range of motivational interviewing techniques and behavioural strategies to promote participants’ uptake of locally available opportunities for physical activity. The aim was to encourage sustainable activity that could be easily incorporated into the participants’ lifestyle. The aspiration was for the participants to engage in moderate or vigorous activity for 150 minutes a week in bouts of at least 10 minutes, but if that seemed unrealistic then the facilitator encouraged any increase in physical activity, whatever the intensity. The intervention programme comprised an initial hour long face to face assessment session followed by two short telephone contacts, then a further face to face meeting for half an hour. Over the course of 6-8-months, the physical activity facilitator offered up to eight further telephone contacts and one more face to face half hour meeting. The scheduling of sessions was left to the discretion of the physical activity facilitator and the participant, although the intention was to have most sessions early in the intervention period, to encourage an increase in physical activity, whereas the later sessions were less frequent and designed to maintain any change. The expectation was that at least five sessions, including one face to face meeting, would have been completed well before the primary outcome endpoint at four months post-randomisation. The physical activity facilitators worked part-time, came from a psychology or an exercise science background, and received training in delivering the TREAD intervention and working with participants who had depression. The facilitators were regularly supervised by some of the investigators. The primary outcome was the Beck depression inventory (version II) at the four month follow-up. The Beck depression inventory is a self report 21 item scale, with higher scores indicating more severe depression.9 The score was treated as both a continuous outcome (range 0-63) and a binary outcome (<10 indicating recovery). The statistical analysis and reporting of this trial followed the Consolidated Standards of Reporting Trial guidelines,16 and the study protocol was published before the completion of data collection.5 All analyses were performed in Stata 11.1,17 following a prespecified analysis plan approved by the trial steering committee. The primary comparative analyses were conducted using an intention to treat approach without imputation of missing data on outcomes. The primary outcome data (total Beck depression inventory score at four months post-randomisation) were analysed in both continuous and binary form. The continuous outcome was analysed in a linear regression model and is presented as the adjusted difference in mean score between the intervention and usual care groups, taking into account the baseline Beck depression inventory score. The binary outcome was analysed in a logistic regression model and is presented as the adjusted odds ratio of recovery in the intervention group compared with the control group, taking into account the baseline Beck depression inventory score. To account for the variables used for stratification and minimisation in the randomisation process, all models were adjusted for baseline antidepressant use, clinical interview schedule-revised score, recruiting centre, and level of physical activity. As part of the secondary analyses, the Beck depression inventory score was also considered in a linear repeated measures analysis using data from the four, eight, and 12 month follow-up points. Antidepressant use and physical activity were considered as binary outcomes in a logistic regression model using data from the four month follow-up and also in a logistic repeated measures analysis using data from all three time points. All the analyses using repeated measures examined the possibility of a difference in the effect size over time by introducing a time by group interaction term. The intervention group was coded “1” and usual care coded “0” in all analyses—therefore a negative difference in means indicates lower Beck depression inventory scores (and better health) in the intervention group, and an odds ratio of more than 1 represents a greater proportion (of individuals recovered, of antidepressants used, or of being physically active) in the intervention group. Several additional sensitivity analyses of the primary outcome were planned. We investigated the influence of missing data on the results by imputing missing data using multiple imputation chained equation methods (Stata ice procedure version 1.9.5 dated 15 April 2011).17 18 The imputation model included all those variables associated with “missingness” in the primary outcome at four months post-randomisation as well as additional measures for symptoms of depression (Beck depression inventory score) at later follow-ups. We also used robust estimates in Stata to account for clustering by general practice and a previously published method to account for clustering by physical activity facilitator.19 As per protocol analyses are likely to be biased, we estimated the complier-average causal effect20 using instrumental variable regression techniques, to obtain an unbiased estimate of the effectiveness of the intervention in those who received an “adequate dose” before measurement of the primary outcome at four months post-randomisation. This methodology compares the outcome for those who received an “adequate dose” of the intervention (compliers) with a comparable group of “would be” compliers in the usual care group. For the purposes of this analysis on complier-average causal effect, an “adequate dose” was defined in the analysis plan as having received at least five sessions of the intervention by four months post-randomisation, since this reflected the way in which the intervention was structured. In the instrumental variable approach adopted, randomisation is the instrument, with the assumption that the effect of randomisation on the outcome only operates through its effect on treatment. Finally, two preplanned subgroup analyses for the primary outcome were conducted by including an interaction between treatment allocation and severity of depression or level of physical activity at baseline. Sixty five practices agreed to take part in the study, referring a total of 766 patients to the research team. Of 490 people assessed, 361 eligible and consenting participants were successfully randomised (figure⇓). At baseline, 182 people were allocated to the intervention arm and 179 to the usual care arm. Eighty per cent of the participants provided data at the primary outcome follow-up point. Participants who provided follow-up information on the primary outcome were more likely at baseline to be older, own their own home, be educated to “A” level or beyond, be in receipt of counselling, smoke cigarettes, and drink alcohol less than weekly than those who did not provide such information. Fewer participants were lost to follow-up at the four and 12 month time points, where face to face data collection had taken place. The randomised groups were similar on entry to the trial, although the proportion of people employed or in education, married or cohabiting, receiving counselling, or not smoking was slightly higher in the intervention group than in the usual care group (table 1⇓). The physical activity intervention was delivered according to the manual by all five physical activity facilitators, with allocation of participants to each facilitator based on workload, availability, and location. The number of patients seen by each facilitator ranged from 25 to 58. Adherence to the intervention was generally good. A mean 7.2 (standard deviation 4.1) sessions was completed, with 56% (n=102) of participants receiving an adequate dose of at least five contacts by four months post-randomisation. Only 6% (n=11) of the intervention group failed to attend the first appointment with their physical activity facilitator and 71% (n=129) had received an adequate dose of intervention by the end of their involvement in the trial. 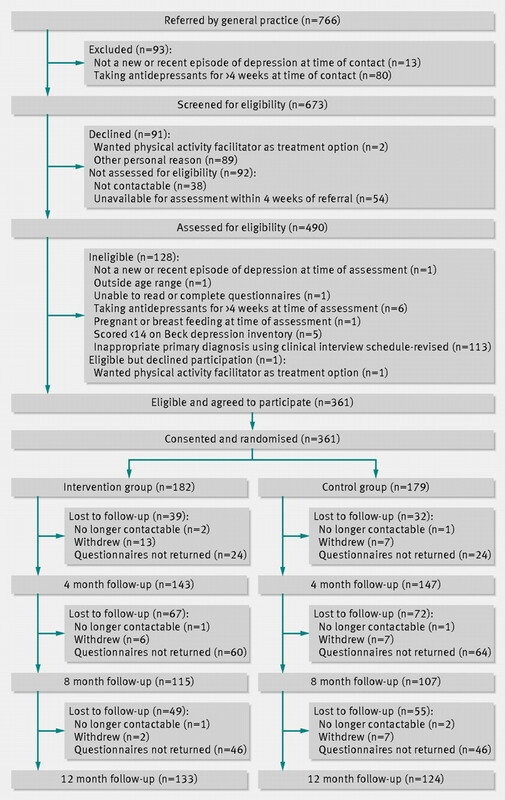 When the Beck depression inventory score was treated as a continuous variable, there was no evidence that participants in the intervention group had a better outcome at four months than those in the usual care group (table 2⇓). The intervention group reported slightly lower scores at the four month follow-up, with an adjusted between group difference in mean score of −0.54 (95% confidence interval −3.06 to 1.99; P=0.68). The proportion of participants who reported a score of less than 10 (that is, “recovered”) was slightly smaller in the intervention group at four months post-randomisation (28.2% in the intervention arm compared with 35.6% in the usual care arm), although there was no evidence of a difference between the randomised groups (adjusted odds ratio 0.66, 95% confidence interval 0.4 to 1.11; P=0.12). Table 2 summarises the results of the additional sensitivity analyses. Firstly, the analysis was performed after multiple imputation of missing data using multiple imputation chained equation methods. The results indicated that missing data might have led to a slight underestimation of the treatment effect, but this was insufficient to alter the overall interpretation of the trial findings. The impact of clustering by practice or by physical activity facilitator was also investigated, but did not alter the results. The calculation of complier-average causal effect estimates indicated that the difference in Beck depression inventory scores between the two treatment groups for those participants who received an “adequate dose” of the intervention was larger than the original intention to treat estimate, although the surrounding confidence interval was wide. Two a priori subgroup analyses provided no evidence to suggest that baseline severity of depression (P=0.87) or level of physical activity (P=0.77) had any influence on the difference between intervention and usual care groups. Table 3⇓ presents the results of the repeated measures analysis, in which data from up to three follow-up points were included per participant. There was no evidence of a difference between the treatment groups over the duration of the study (adjusted difference in mean Beck depression inventory score −1.20, 95% confidence interval −3.42 to 1.02; P=0.29) or of any differential effect across the three follow-up points (time by treatment interaction P=0.61). The proportion of participants reporting use of antidepressants was smaller in both groups at the end of the trial compared with baseline (table 4⇓). However, there was no evidence to suggest any difference between the groups at either the four month follow-up point (adjusted odds ratio 1.20, 95% confidence interval 0.69 to 2.08; P=0.52) or over the duration of the trial. Nor was there any evidence of any differences in treatment effect across the three follow-up points (time by treatment interaction P=0.22). Table 5⇓ shows there was some evidence for a difference in reported physical activity between the groups at four months post-randomisation (adjusted odds ratio 1.58, 0.94 to 2.66; P=0.08) and much stronger evidence for this effect when data from all three follow-up points were considered together. However, there was no evidence that the difference between the groups changed over the duration of the study (time by treatment interaction P=0.71). Adults presenting with depressing in primary care and receiving the TREAD (TREAtment of Depression with physical activity) intervention in addition to usual care reported increased physical activity compared with those receiving usual care alone, although there was no evidence to suggest that the intervention brought about any improvement in symptoms of depression or reduction in antidepressant use at the four month follow-up point. We considered whether our result was sufficiently precise to rule out the possibility of a beneficial effect. The most statistically powerful analysis was using the Beck depression inventory as a continuous outcome measure. The results for our primary analysis indicated an adjusted between group difference in mean Beck depression inventory scores of −0.54 (95% confidence interval −3.06 to 1.99). It is difficult to define precisely what would constitute a clinically important treatment effect, but the National Institute for Health and Clinical Excellence guideline panel23 have suggested that this could correspond to around 3 points or 0.35 standard deviations at baseline on the Hamilton depression rating scale24 and close to the 0.33 standard deviations used in our power calculation. The equivalent difference in terms of Beck depression inventory score would be between 4.1 and 3.9 points, respectively, based on our observed standard deviation of 11.8 points at four months post-randomisation. This suggests that we have excluded the possibility, at least with 95% confidence, that the intervention added to usual care is clinically effective in improving symptoms of depression compared with usual care alone. Our trial recruitment rate was lower than initially planned but we reviewed and amended the variables in our power calculation and subsequently achieved the revised recruitment target. While our retention rate at the four month follow-up was, at 80%, slightly lower than that outlined in the protocol, our sensitivity analyses indicated that missing data probably had little impact on our findings. Moreover, our findings show that the resulting dataset was sufficiently large to estimate confidence intervals that excluded a clinically meaningful difference in outcome between the groups. The trial is one of the largest trials of physical activity and depression to have taken place in primary care. Baseline comparability of the two treatment groups was good. Although we used self reported outcome data in an effort to eliminate any observer bias, it is possible that the participants’ responses could have been influenced, to some degree, by their knowledge of their treatment allocation. Physical activity is notoriously difficult to measure and the self reported assessment could have been biased by knowledge of the treatment allocation. The effect of the intervention on physical activity outcomes must therefore be treated with some caution. However, comparison of the data reported in the physical activity recall diary with accelerometry data indicated reasonable agreement between the two measures.6 If knowledge of treatment allocation was to bias the responses to physical activity, then it might also be expected to have led to a difference in the scores for symptoms of depression. One important difference between TREAD and previous studies was the development of an intervention that aimed specifically to produce more lasting change in physical activity levels.10 Adherence to the intervention supports the perceived acceptability of using the TREAD approach,6 and the reported increase in physical activity sustained over the entire 12 month follow-up period indicates that our purpose in designing the intervention was achieved. Indeed the results show a slight increase in the apparent effectiveness of the intervention over the course of the study, which is unusual in trials designed to boost physical activity, with either depressed or non-depressed participants.26 27 The effect on physical activity reported here (adjusted odds ratio 2.27, 95% confidence interval 1.32 to 3.89) was also larger than the pooled estimate from a recent review of exercise referral schemes (pooled risk ratio 1.16, 95% confidence interval 1.03 to 1.30).27 The fact that participants were recruited directly from primary care and were not selected on the basis of their interest or motivation to engage in physical activity adds further weight to the success of the intervention. It is, however, possible that only those participants with relatively positive views of physical activity would have agreed to be involved in the first place. The main implication of our results is that advice and encouragement to increase physical activity is not an effective strategy for reducing symptoms of depression. Although our intervention increased physical activity, the increase may not have been sufficiently large to influence depression outcomes. The absolute difference between the randomised groups in terms of the proportion meeting our physical activity threshold was about 15% so there is still a possibility that physical activity itself might have some benefits for depression. However, this does not alter our conclusion about the lack of effectiveness of facilitated physical activity as an adjunct treatment to usual care for depression. The TREAD intervention was a pragmatic and acceptable intervention that could be implemented in the National Health Service and increase physical activity levels but had no impact on symptoms of depression. There is empirical evidence from experimental studies in volunteers that some people report improved affect and pleasure while exercising at moderate levels. In contrast, vigorous activity is almost always experienced as unpleasant while it is performed but there is improved affect and pleasure shortly after finishing, perhaps resulting from endogenous opioid activity, the “runner’s high.”28 This might explain why some participants in the trial reported that physical activity helped to improve their mood.29 Perhaps an intervention that focused only on vigorous physical activity might be more effective, although we suspect that this would be less acceptable to participants and difficult or even impossible to sustain. A better understanding of the underlying mechanisms that might link physical activity and mood could lead to new therapeutic opportunities. The TREAD intervention increased self reported physical activity, an effect that lasted beyond the duration of the intervention. Our approach towards increasing physical activity put emphasis on promoting choice and autonomy. It did not rely simply on giving advice but drew on a range of behaviour change techniques. Physical activity might have benefits for patients with medical conditions such as obesity, diabetes, and cardiovascular disease. This approach to increase physical activity might be useful for people with or without depression who also have these other medical conditions. We thank the patients and staff who participated in the trial; members of our trial steering committee and data monitoring committee for their valuable support throughout the research (Michael King, Chris Dowrick, Margaret Thorogood, Paul Lanham, Helen Lester, Kerry Hood, and Keith Lloyd); the Mental Health Research Network and Primary Care Research Network in connection with data collection; the contribution of the Department of Health and local primary care trusts in meeting the excess treatment and service support costs associated with the trial; and the following colleagues who contributed to the recruitment and retention of patients, provided administrative support to the study, or delivered the intervention to study participants: Georgina Bentley, Susan Bryant, Amanda Burston, Kate Button, Julia Carver, Joy Choules, Sarah Dawkins, Nathan Filer, Davina Chauhan, Emily Gale, Alice Garrood, Charlotte Hale, Caroline Jenkinson, Rhodri Lewis, Linda Mottram, Adam Saint, Sofie Sherlock, Helen Thorp, Tom Thompson, Alison Wellingham, and Joanna Yarham. The views and opinions expressed herein are those of the authors and do not necessarily reflect those of the Department of Health. Contributors: AMH, NJW, AAM, SPH AHT, KRF, DAL, TJP, DJS, JC, and GL were responsible for the initial proposal, securing funding for the trial, and drafting the original protocol. GL, as principal investigator, had overall management responsibility for the study. MC, as trial coordinator, was responsible for the day to day operationalisation of the trial and monitored data collection. AMH, KRF, AHT, and GL developed the physical activity intervention. All authors contributed to the refinement of the trial protocol and development of the data collections tools. HB, RW, CW, and AS were responsible for data collection and revised the draft paper. MC, NJW, AAM, TJP, DAL, and GL wrote the statistical analysis plan. MC and GL carried out the cleaning, analysis, and interpretation of the data with the assistance of CC, NJW, and AAM. MC and GL wrote the initial draft of the manuscript. All authors contributed to and approved the final manuscript on behalf of the wider research team. MC and CC used data from the study for their PhD and MSc theses, respectively. Funding: This research was carried out independently by the University of Bristol, University of Exeter and the Peninsula Medical School. It is funded by the Department of Health as part of the National Institute for Health Research Health Technology Assessment programme. Ethical approval: This study was approved by the West Midlands multicentre research ethics committee (MREC 05/MRE07/42), and research governance approval was given by the relevant local National Health Service primary care trusts. The research is listed on the National Research Register and the International Standard Clinical Trial Register. McCrone P, Dhanisiri S, Patel A, Knapp M, Lawton-Smith S. Paying the price: the cost of mental health care in England to 2026. King’s Fund, 2008. Hyde J, Calnan M, Prior L, Lewis G, Kessler D, Sharp D. Reluctant medicalisers? A qualitative study exploring how general practitioners decide to prescribe antidepressants. Br J Gen Pract2005;55:755-62. Mead GE, Morley W, Campbell P, Greig CA, McMurdo M, Lawlor DA. Exercise for depression. Cochrane Database Syst Rev2009;3:CD004366. National Institute for Health and Clinical Excellence. Depression: the treatment and management of depression in adults (updated edition). British Psychological Society and Royal College of Psychiatrists, 2009. Baxter H, Winder R, Chalder M, Wright C, Sherlock S, Haase A, et al. Physical activity as a treatment for depression: the TREAD randomised trial protocol. Trials2010;11:105. Chalder M, Wiles N, Campbell J, Hollinghurst S, Searle A, Haase A, et al. A pragmatic randomised controlled trial to evaluate the cost-effectiveness of a physical activity intervention as a treatment for depression: the TREAD trial. Health Technol Assess2011;16:1-162. Lewis G, Pelosi AJ, Araya R, Dunn G. Measuring psychiatric disorder in the community: a standardised assessment for use by lay interviewers. Psychol Med1992;22:465-86. Lewis G. Assessing psychiatric disorder with a human interviewer or a computer. J Epidemiol Community Health1994;48:207-10. Beck AT, Ward CH, Mendelsohn M, Mock J, Erbaugh J. An inventory for measuring depression. Arch Gen Psychiatry1961;4:561-71. Haase A, Taylor A, Fox KR, Thorp H, Lewis G. Rationale and development of the physical activity counselling intervention for a pragmatic trial of exercise and depression in the UK (TREAD-UK). Ment Health Phys Act2010;3:85-91. Deci EL, Ryan RM. Intrinsic motivation and self-determination in human behaviour. Plenum, 1985. Ainsworth BE, Haskell WL, Whitt MC, Irwin ML, Swartz AM, Strath SJ, et al. Compendium of physical activities: an update of activity codes and MET intensities. Med Sci Sports Exerc2000;32:S498-504. Department of Health Start active, stay active: a report on physical activity from the four home countries’ Chief Medical Officers. Department of Health, 2011. Stewart AD, Hays RD, Ware JE. The MOS short-form General Health Survey. Med Care1988;26:724-32. Resnick B, Zimmerman SI, Orwig D, Furstenberg ALMJ. Outcome expectations for exercise scale: Utility and psychometrics. J Gerontol: Soc Sci2000;55B:S352-6. StataCorp. Stata Statistical Software. (Release 11). College Station, Texas, 2010. Dunn G, Maracy M, Tomenson B. Estimating treatment effects from randomized clinical trials with noncompliance and loss to follow-up: the role of instrumental variable methods. Stat Methods Med Res2005;14:369-95. Kessler D, Lewis G, Kaur S, Wiles N, King M, Weich S, et al. Therapist-delivered Internet psychotherapy for depression in primary care: a randomised controlled trial. Lancet2009;374:628-34. Lewis G, Mulligan J, Wiles N, Cowen P, Craddock N, Ikeda M, et al. Polymorphism of the 5-HT transporter and response to antidepressants: randomised controlled trial. Br J Psychiatry2011;198:464-71. National Institute for Health and Clinical Excellence. Depression: management of depression in primary and secondary care. British Psychological Society and Royal College of Psychiatrists, 2004. Hamilton M. A rating scale for depression. J Neurol, Neurosurg Psychiatry1960;23:56-62. Krogh J, Nordentoft M, Sterne JA, Lawlor DA. The effect of exercise in clinically depressed adults: systematic review and meta-analysis of randomized controlled trials. J Clin Psychiatry2011;72:529-38. Hillsdon M, Foster C, Thorogood M. Interventions for promoting physical activity. Cochrane Database Syst Rev2005;1:CD003180. Pavey TG, Taylor AH, Fox KR, Hillsdon M, Anokye N, Campbell JL, et al. Effect of exercise referral schemes in primary care on physical activity and improving health outcomes: systematic review and meta-analysis. BMJ2011;343:d6462. Ekkekakis P, Hall EE, Petruzzello SJ. Variation and homogeneity in affective responses to physical activity of varying intensities: an alternative perspective on dose-response based on evolutionary considerations. J Sports Sci2005;23:477-500. Searle A, Calnan M, Lewis G, Campbell J, Taylor A, Turner K. Patients’ views of physical activity as treatment for depression: a qualitative study. Br J Gen Pract2011;61:149-56.